This dish reminds me very much of home. Braised pork belly served between slices of steamed buns were a frequent fixture of casual Sunday lunches, and I’ve found it a bit silly that pork belly buns in New York City are such a gourmet foodie item. I’ve had pork belly buns at a few places: Ippudo, Baohaus, and Jum Mum, a new bun place opened by the creators of Spot Dessert bar. After having made this dish myself, I can now understand why people pay for it. Because making tender meat just isn’t easy. 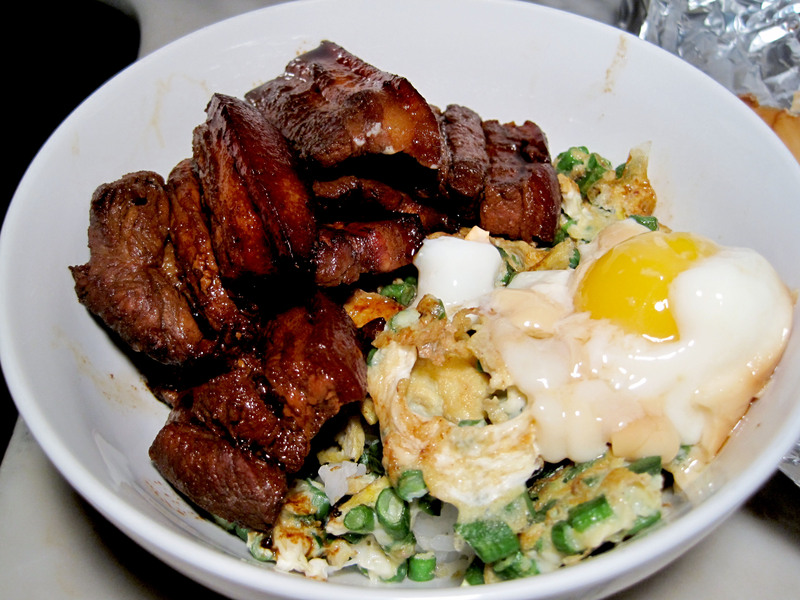 My version tastes excellent – but the texture does not melt in your mouth like Ippudo’s pork belly buns would. Did I not devour my dinner because of that? No. This contains so much nostalgia for me, and I love it. The yard-long bean and egg omelet you see is another staple in my home. 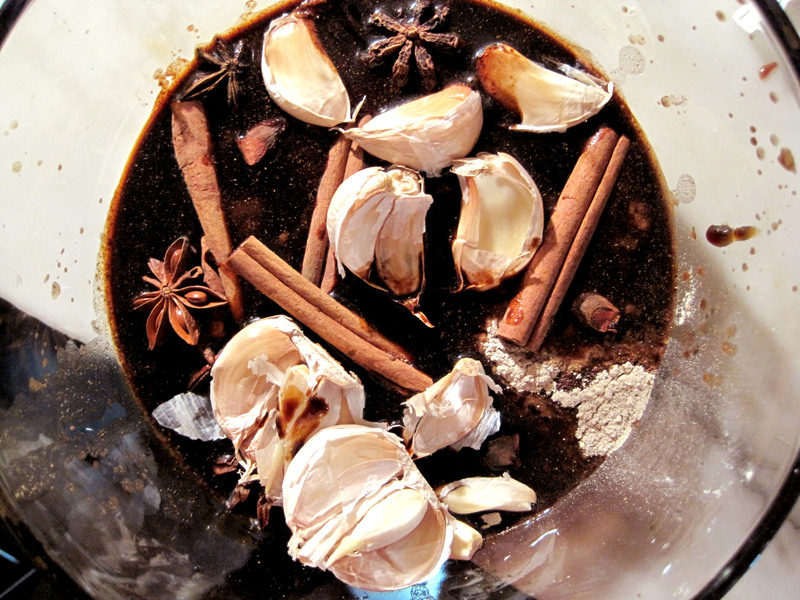 Here’s how the marinade looked like. I’m so glad I had most of the obscure ingredients: cinnamon sticks, star anise, Chinese cooking wine… I didn’t have ketchup or oyster sauce like the original recipe called for, but I used some hoisin sauce instead and I thought it was a good substitute for both the ketchup and oyster sauce taste. Adding the eggs was a bit of an impromptu decision – the standard would have been to boil the eggs first before marinating it, but I impulsively adding the eggs just before baking and when it was done cooking, it ended up such a beautifully coddled egg. 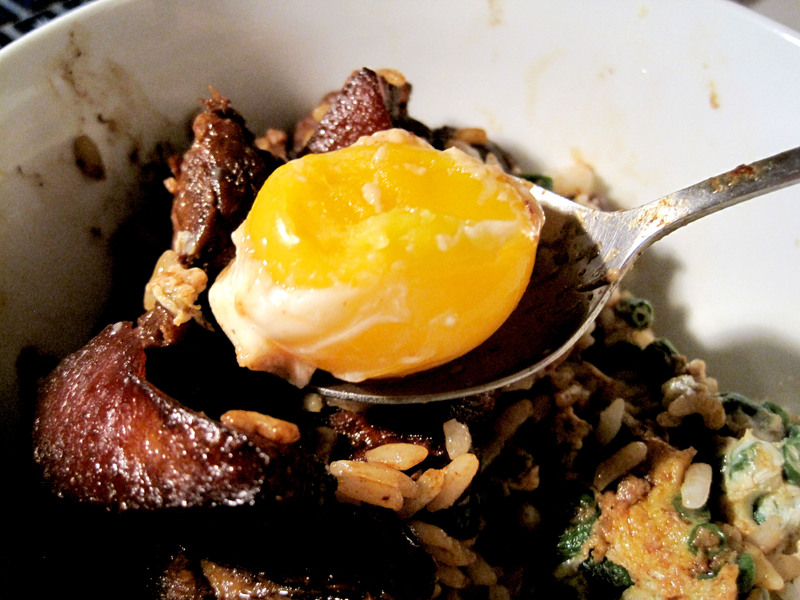 The egg yolk was richly yellow but still a solid mass. Total mouth party. 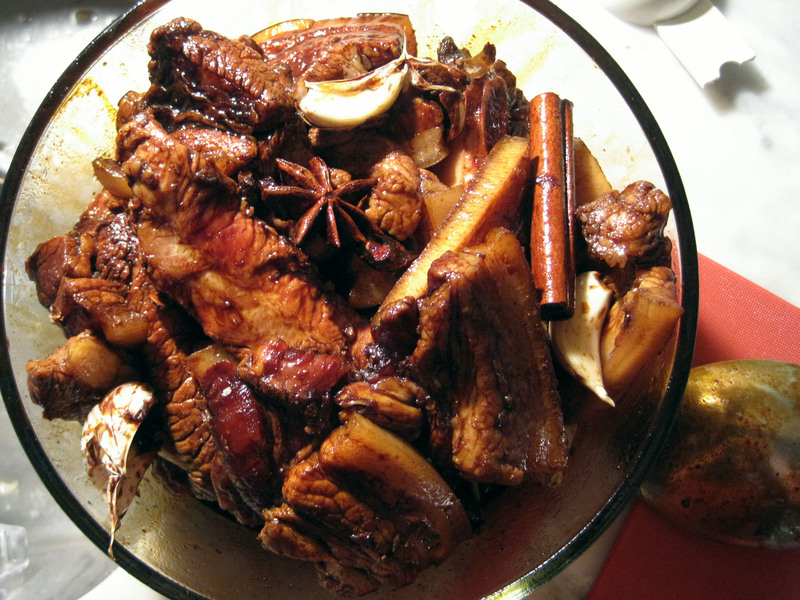 Bring water to boil in wok or pot and blanch the pork belly for approximately 30 seconds. You will notice that the meat is slightly cooked and the skin is slightly toughened. Remove from water and drain. Prick the skin with the sharp end of a knife or sharp fork. Next, heat up oil in wok and fry the pork belly 20 seconds on each side (skin side and meat side). Remove and place on a rack for to cool and to let excess oil drip. 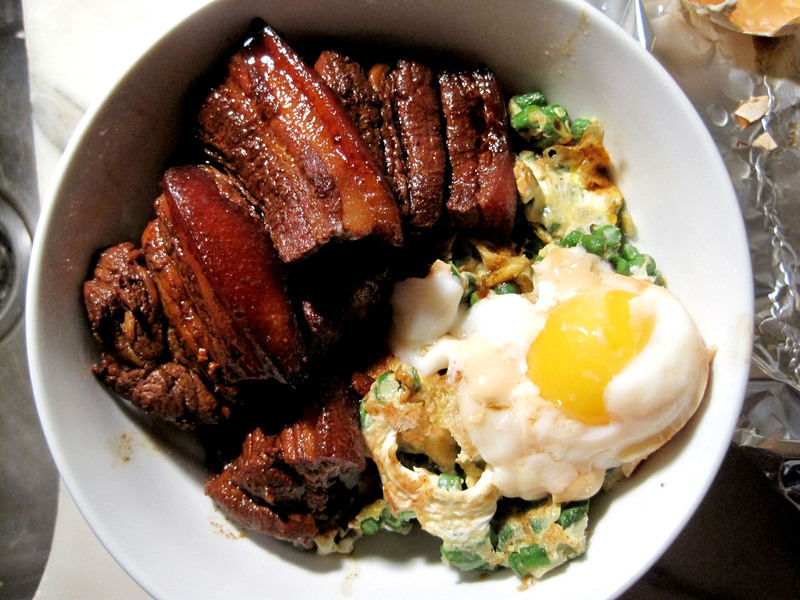 You will notice that the meat and skin is now slightly browned and the whole piece of pork belly is slightly firm. Cut the pork belly into 1 to 1.5cm-width slices. 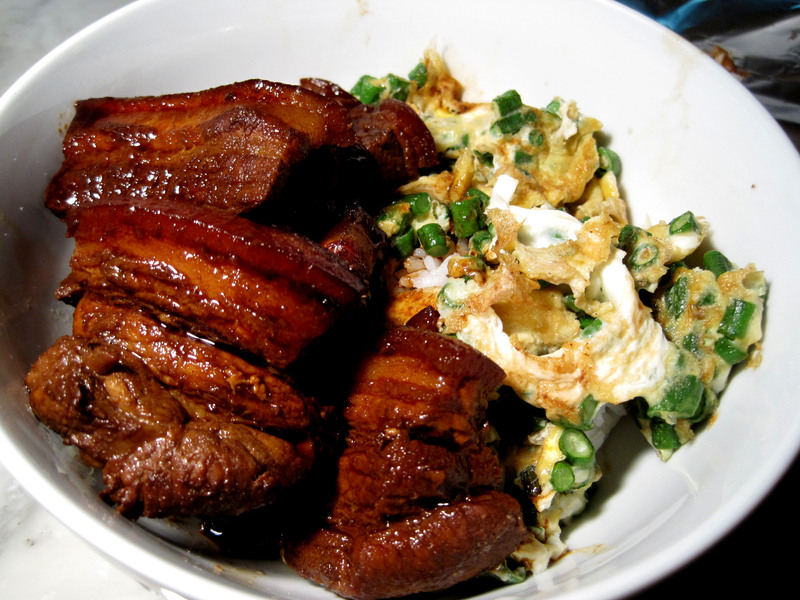 Place the pork belly slices and eggs in a suitable container and marinade them with the marinate above for at least 2 hours or longer. Preheat the oven to 250 F 15 minutes before cooking. Loved your sweet recipes, but your savory ones are really great too. I’m totally inspired. Also, can relate to the amusement at pork belly being a delicacy haha. It’s how I feel when I see goat-anything and plantains in foodie/gourmet circles. Thanks for the post and inspiration! Hoping to amass a similar sort of archive in the nutrition section of my blog. (onehundredweeks.wordpress.com).